H.E. 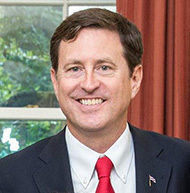 Román Macaya Hayes, WG, Ambassador of Costa Rica to the United States was sworn in as Ambassador of Costa Rica to the United States after presenting his credentials to President Barack Obama on September 18, 2014. Ambassador Macaya is well versed in many areas of study, earning a Ph.D. in Biochemistry from UC LA, a B.A. in Chemistry from Middlebury College and an M.B.A in Health Care Management from the Wharton School. He has given over 200 international presentations discussing health care issues and has been extremely active with the World Health Organization, the Food and Agriculture Organization as well as the World Trade Organization. Organization conducting clinical trials, chief investment officer for a healthcare private equity fund, and a Managing Partner for a healthcare consulting firm. In November, 2016, he received the Wharton Club of DC's Joseph Wharton Award, the Club's highest honor, at the 46th Annual Joseph Wharton Award Dinner. He thereby joined a distinguished group of honorees, including other Ambassadors, public and private sector executives, entrepreneurs, and other distinguished and successful Wharton and Penn alumni.